A ride without enjoying it is not a ride at Discovery Mundo. 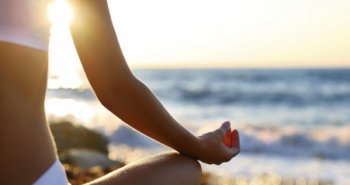 On this post, I will explain you with details of how is the experience of a smooth ride from Cancun International Airport to the beautiful and relax center of Tulum, in few words from Cancun to Tulum. 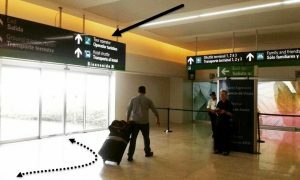 First of all, if you are arriving at Cancun International Airport for the first time you must know that there are 3 international terminals and 2 National terminals. 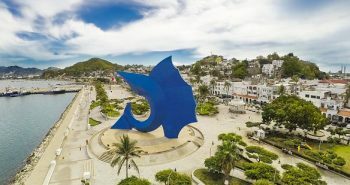 Depending in which terminal you are arriving would be the pickup, but in general, just right outside the terminal for Hotel Shuttles / Transportation Companies you will find your representative holding a sign with the logo of Discovery Mundo and if you book with more than 24 hours in advance, He will also have your name. 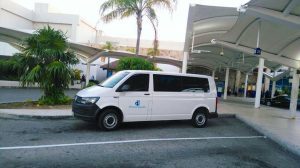 Arriving at Cancun International Airport can be really excited and a little messy, more if you know you are taking a long trip from Cancun to Tulum. After you pass immigration and baggage claim, the first impression of your vacation (besides the INCREDIBLE view from the window of the airplane) will be maybe a bunch of representatives telling you a lot of things like: “Hey, do you want free vacations for a year?”, it’s kind of funny sometimes…Anyway, after all of that and passing the exit door to the terminal, you will find the representatives area, don’t freak out, be happy you made it! A good tip: be prepared with your arrival instructions, find out which is the meeting point for your terminal and the representative will be there looking for you in case he doesn’t see you around first. Terminal 1: It has just one exit. You exit directly to pick up area after picking up your luggage. Once you meet your representative, he will call your driver and guide you to the corresponding park area. 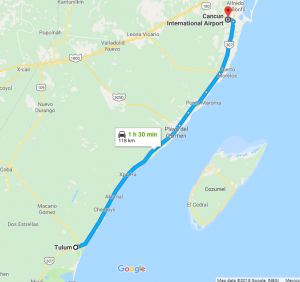 The driver will help you with your bags, open the door for you and give you a Happy Welcome to Cancun =) He will also confirm your destination, in this case: Cancun to Tulum! 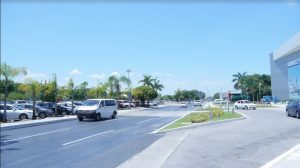 Once you get outside the airport, from Cancun to Tulum it might be a little traffic between the intersection to get outside the avenue of the airport and in Playa del Carmen (500 meters or 1 km approximately of traffic). 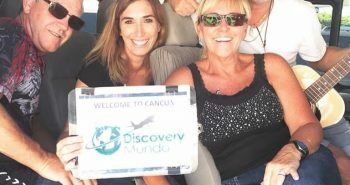 Another tip to enjoy the ride from Cancun to Tulum: ask your customer agent to include some drinks for the ride, Discovery Mundo offers beer, soda, juices or water for only 2 USD each, this will allow you and your friends to enjoy the ride like if you are in a VIP movie! You will be traveling on air conditioner, brand new model unit, happy driver, drinks, snacks and also, you can connect the music of your preference to the radio! So what is exactly on the way? 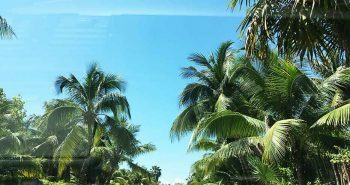 You will see a lot of trees, all-inclusive hotels, the main parks like Xplor, Xoximilco, Xel Ha, tours for Cenotes, restaurants and local business. 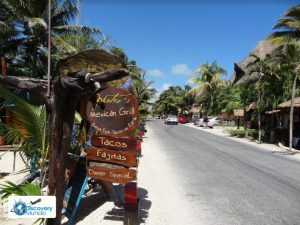 Almost at the end of your trip from Cancun to Tulum, note that the street in Tulum is very short so it will take a while to pass the hotel zone, but the view is great!